Drexel has been accepted to participate in the Integrated Path to Architectural Licensure (IPAL). The practice of architecture requires a unique skill set—creative thinking and aesthetic sensitivity balanced with technical knowledge, cultural understanding, and social responsibility, all coupled with the ability to communicate effectively. Drexel’s Bachelor of Architecture curriculum encompasses foundation courses in the applied and social sciences, the humanities, and a wide range of professional architecture courses to prepare students for careers in architecture and related fields. At the heart of the curriculum are the design studios where students are challenged to apply their knowledge acquired from the above disciplines to consequential design problems. The mission of the Drexel Architecture Program is to pursue architecture as a professional discipline by combining the rigors of the academy with the realities of contemporary architectural practice. The program does this by providing a strong, broadly based curriculum in the arts, humanities, social sciences and the applied sciences coupled with professional courses taught by faculty who reflect the broad diversity of architectural practice today. 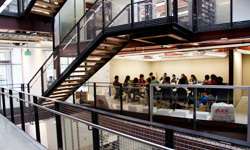 Drexel’s work/study program is an experiential-based learning model that complements and provides an alternative to traditional studio-based programs. The Drexel model provides a practical, high-quality education to those students who seek early exposure to daily architectural practice as well as an affordable alternative to students who could not otherwise be able to enter the profession. At Drexel there are two paths to an accredited Bachelor of Architecture degree, serving two distinct populations. The 2+4 Option is an accelerated route designed for a small class of well-prepared students entering directly from high school. In this program two years of full-time coursework address the basic principles of architectural design and satisfy fundamental university core requirements in the arts and sciences as well as those job-related skills that are needed for entry-level professional positions. A comprehensive review of performance will take place after each year to ensure that students are making sufficient progress in all areas. After successfully completing the minimum requirements of the full-time phase, students find full-time employment in the building industry, including architecture firms, while continuing their academic program part-time in the evening for four additional years. By combining work and study, Drexel students may be able to simultaneously satisfy their required internship for licensure (IDP) while completing their professional degree, thus qualifying for the registration exam on graduation in most jurisdictions. The Part-Time Evening option is one of only two part-time evening architectural programs in the United States, leading to an accredited Bachelor of Architecture degree. Designed for non-traditional and transfer students, this program offers all courses part-time in the evening, enabling students to work full-time. The Evening option sequence is seven years, but transfer students with university-level design credits may reduce its length by meeting specific program requirements through transcript and portfolio review. All Drexel architecture students may be able to receive credit in the Architecture Experience Program (AXP) for work experience obtained before graduation, which is part of most state licensure requirements. The Bachelor of Architecture program is accredited by the National Architectural Accrediting Board (NAAB). For more information on both tracks also visit the Drexel University Undergraduate Architecture Catalog. In the United States, most registration boards require a degree from an accredited professional degree program as a prerequisite for licensure. The National Architectural Accrediting Board (NAAB), which is the sole agency authorized to accredit professional degree programs in architecture offered by institutions with U.S. regional accreditation, recognizes three types of degrees: the Bachelor of Architecture, the Master of Architecture, and the Doctor of Architecture. A program may be granted an eight-year, three-year, or two-year term of accreditation, depending on the extent of its conformance with established educational standards. Doctor of Architecture and Master of Architecture degree programs may require a preprofessional undergraduate degree in architecture for admission. However, the preprofessional degree is not, by itself, recognized as an accredited degree. Drexel University’s Westphal College of Media Arts & Design Department of Architecture, Design & Urbanism offers the following NAAB-accredited degree program: B. Arch. 227 quarter credits (150 undergraduate credits equivalent). Drexel University Architecture Program Accreditation Reports and Documents.